Tesla Gears - Fade, shrink, and wrinkle resistant. Duratex fabric repels liquids, dirt, and other contaminants. 65% polyester 35% cotton Rip-stop fabric materials. Cqr tactical pants are constructed with a hint of military and law enforcement performance design. Exclusive Tactical Belt Sold Separately*. Velcro tape hatched back pocket design for easy access even when gloves are worn.
. Cqr tactical gear are constructed with a hint of military and law enforcement performance design Duratex functions 100% the same as Teflon repels liquids, dirt, and other contaminants Elastic Action Waist Band Specially designed form fitting elastic waistband for comfort and support. 8 multi-purpose cargo pockets for various tools and equipment. Flap & non flap magazine pockets Non-flap magazine pocket for quick storage of tactical equipment, tools or cell phones. Flap pocket for a more secure storage. Tactical velcro flap pockets Secure Velcro flapped outpocket that offers safe storage of tactical equipment or cell phones. Upgraded 1 Front Flap pocket. CQR CQ-TLP105-KHK_38W/32L Men's Tactical Pants Lightweight EDC Assault Cargo TLP105 - Knee pad insert lining inner pockets for insertable tactical knee pads Knee pads sold separately Dual Layered Seat Pattern Dual-layered bottom pattern protects the body effectively when sitting on rough terrains or during tactical activities. Exclusive tactical belt sold separately Zinc Alloy D-Ring Black Nickel plated D-Ring provides a easy hook-on installation of tactical accessories. Slash pocket large deep front pockets that can be accessed even with gloves on. Tesla Gears - Rip-resistant 1. 5" strenghtened nylon webbing ★Relatively inexpensive, virtually indestructible and lightweight★. Cqr duty belts are constructed with military standard and law enforcement design Military Specification standard design for durability, ruggedness and reliability. Non-metal high-density plastic polymer buckle * Never worry about TSA or metal detector security★. Rip-resistant 1. 5" single layer nylon webbing non-metal sturdy plastic polymer buckle two rear inserted pockets with velcro flap design Exceptional versatility crafted with a simple and efficient design Perfect for every occasion yet rugged for many applications An easy thread belt tip ensures fast on and off Cqr brand certified guaranteed ★the best and only Tactical belt you'll ever need. CQR Tactical Belt 100% Full Refund Assurance Nylon Webbing EDC Duty 1.5" Belt MZT01/MZT02/MZT22 - Size chart: small w28 - 30 medium w32 - 34 large w36 - 38 xl w40 - 42 XXL W44 - 46★. 30-days no risk 100% full refund Assurance ★. Equipment belt ★daily belt ★ work belt ★edC Everyday Carry Belt ★Suitable for military, maintenance, and everyday life ★. If you are not satisfied for any reason, money back guarantee! Tesla Gears - High-strength high-density metal alloy snap button and zipper along with a durable mounted stopper. Slash pocket large deep front pockets that can be accessed even with gloves on. Tactical velcro flap pockets Secure Velcro flapped outpocket that offers safe storage of tactical equipment or cell phones. Equipment belt ★daily belt ★ work belt ★edC Everyday Carry Belt ★Suitable for military, maintenance, and everyday life ★. Exclusive tactical belt sold separately Zinc Alloy D-Ring Black Nickel plated D-Ring provides a easy hook-on installation of tactical accessories. Fade, shrink, and wrinkle resistant. Knee pad insert lining inner pockets for insertable tactical knee pads Knee pads sold separately Dual Layered Seat Pattern Dual-layered bottom pattern protects the body effectively when sitting on rough terrains or during tactical activities. 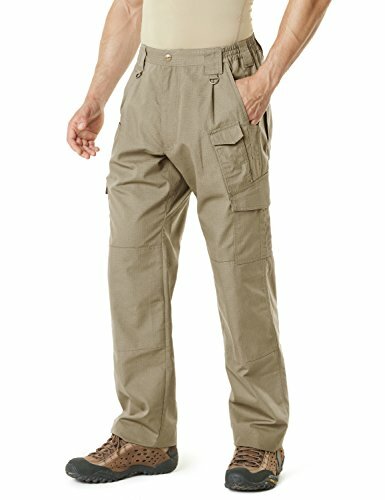 CQR Men's Tactical Pants Lightweight EDC Assault Cargo TLP104 / TLP105 - 8 multi-purpose cargo pockets for various tools and equipment. Velcro diagonal line shape prevents clothing from sliding down a quick connection and activity. Velcro tape hatched back pocket design for easy access even when gloves are worn. Cqr tactical pants are constructed with a hint of military and law enforcement performance design. Duratex fabric repels liquids, dirt, and other contaminants. 65% polyester 35% cotton Rip-stop fabric materials. Tesla Gears - High-strength high-density metal alloy snap button and zipper along with a durable mounted stopper. If you are not satisfied for any reason, money back guarantee!8 multi-purpose cargo pockets for various tools and equipment. Multi-functional: includes 1 front sunglass/Rod holder loop, 1 Pen holder on the left breast, 2 adjustable sleeve-keepers, and a interior locker loop. Tacti-cool tech : features a Mesh ventilation in the back and shoulders for maximm breathability. Ex size "large recommended"- size for 6" 215 lbs - based on customer reviews 08-27-18. Duratex functions 100% the same as teflon repels liquids, dirt, and other contaminants Duratex Coated Ripstop Fabric Duratex Ripstop fabric provides excellent durability and cool comfort. CQR Men's Outdoor PFG UPF 50+ Long/Short-Sleeve Breathable Shirt TOS421 / TOS401 - Non-metal high-density plastic polymer buckle * Never worry about TSA or metal detector security★. Cqr performance fishing Shirts constructed for all outdoor activities and sports. Ex size "large" 6'2"182 lbs - Pictured Model's Measurements. Cqr fishing shirts are constructed constructed for all outdoor activities and sports. Multi-purpose pocket layout dual flap pockets w velcro & 2 hidden pockets multi-function features front sunglass holder loop Adjustable Sleeve-Keepers Provides full range of motion and holds the cuff sleeves in place Extra Features 1 Front Sunglass holder loop & 1 pen holder loop Anti-Odor Fabric Anti-Microbial / Repels dirt and liquids Cqr brand certified guaranteed ★the best and only Tactical belt you'll ever need. Equipment belt ★daily belt ★ work belt ★edC Everyday Carry Belt ★Suitable for military, maintenance, and everyday life ★. Collar flips up for UV next protection. Tesla Gears - Non-flap magazine pockets for quick storage of equipment. 30-days no risk 100% full refund Assurance ★. Size chart: small w28 - 30 medium w32 - 34 large w36 - 38 xl w40 - 42 XXL W44 - 46★. Equipment belt ★daily belt ★ work belt ★edC Everyday Carry Belt ★Suitable for military, maintenance, and everyday life ★. 8 multi-purpose cargo pockets for various tools and equipment. Total of 3 d-rings primarily used as a lashing point. Materials: cotton 64% Nylon 30% Spandex 6%. 1 hidden inside lower pocket. Cqr performance fishing Shirts constructed for all outdoor activities and sports. Ex size "large" 6'2"182 lbs - Pictured Model's Measurements. CQR Men's Urban Tactical Lightweight Utiliy EDC Cargo Classic Uniform Shorts TXS410/TSP202 - Action waistband form fitting waistband for comfort and security D-Ring & Non Flap Pocket D-Ring provides easy hook-on installation of tactical accessories. If you are not satisfied for any reason, money back guarantee! Ex size "medium" 5'9"165 lbs - based on customer reviews 08-27-18. Non-metal high-density plastic polymer buckle * Never worry about TSA or metal detector security★. Cqr tactical pants are constructed with a hint of military and law enforcement performance design. Duratex fabric repels liquids, dirt, and other contaminants. - Total of 3 d-rings primarily used as a lashing point. Non-metal high-density plastic polymer buckle * Never worry about TSA or metal detector security★. The urban ops pants offer an improved fit and ultra-lightweight material, while still being tough, durable, and most of all useful. Fade, shrink, and wrinkle resistant. The articulating knees and gusseted crotch allow for better movement. The urban ops pants are constructed from a lightweight yet resilient 65% cotton and 35% polyester rip-stop fabric, and include an elastic waistband so you are as comfortable as possible all day. Materials: cotton 64% Nylon 30% Spandex 6%. LA Police Gear Mens Urban Ops Tactical Cargo Pants - Elastic WB - YKK Zipper - Cqr tactical pants are constructed with a hint of military and law enforcement performance design. Duratex fabric repels liquids, dirt, and other contaminants. 65% polyester 35% cotton Rip-stop fabric materials. Cqr performance fishing Shirts constructed for all outdoor activities and sports. Ex size "large" 6'2"182 lbs - Pictured Model's Measurements. Upf 50+ : fabric that protects against 98% of harmful rays for all day protection. The front slip pocket is perfect for a cell phone or for an AR-15 magazine. Ex size "large recommended"- size for 6" 215 lbs - based on customer reviews 08-27-18. Tesla Gears - Alert : one size UP for comfortable and relax fit. High-strength high-density metal alloy snap button and zipper along with a durable mounted stopper. Ex size "large" 6 ft 167 lbs - Pictured Model's Measurements. Fabric content: knit-mesh chest & knit Body area C/PE/PU 56%/40%/4%. Ex size "large recommended"- size for 6" 215 lbs - based on customer reviews 08-27-18. Fade, shrink, and Quick-Dry Fabric Material. Total of 3 d-rings primarily used as a lashing point. 1 hidden inside lower pocket. Features a high end ykk Locking Brass Zipper and a tough brass tac-stud closure for the waist. We recommend ordering one size up regular fit order usual size extreme compression fit cqr tactical compressiom baselayers are constructed with a hint of military and law enforcement performance design Dual-layer fabric encorporates No See Through Mesh ventilation panels on vital areas Stretch-mesh back side panels provide strategic ventilation Flat-lock seam Provides excellent comfort and seamless feel protection Early recovery Promotoes recovery after hard workouts, helps to control blood flow and prevents soreness Shields Ultraviolet Rays Safeguards your skin from harmful UV rays by more than 99% UPF 50+ Deodorization function Repels unpleasant smells left behind from dirt and sweat Cqr brand certified guaranteed ★the best and only Tactical belt you'll ever need. CQR Men's Performance Combat Top Military UPF 50+ Shirt TOS201 - Materials: cotton 64% Nylon 30% Spandex 6%. 8 multi-purpose cargo pockets for various tools and equipment. Cqr combat shirts are constructed with a hint of military and law enforcement performance design. Cqr performance fishing Shirts constructed for all outdoor activities and sports. Condor 101060 - The fabric is now knitted polyester that is treated to help wick more moisture and constructed to allow for better ventilation. Materials: cotton 64% Nylon 30% Spandex 6%. Cqr performance fishing Shirts constructed for all outdoor activities and sports. Ex size "large" 6'2"182 lbs - Pictured Model's Measurements. Total of 3 d-rings primarily used as a lashing point. Sunglasses clip under buttons; Microphone clip on shoulders. The condor performance Tactical Polo is a re-vamped on duty essential. Cqr combat shirts are constructed with a hint of military and law enforcement performance design. Ex size "large recommended"- size for 6" 215 lbs - based on customer reviews 08-27-18. Condor Outdoor Performance Tactical Polo - Multi-functional: includes 1 front sunglass/Rod holder loop, 1 Pen holder on the left breast, 2 adjustable sleeve-keepers, and a interior locker loop. Tacti-cool tech : features a Mesh ventilation in the back and shoulders for maximm breathability. Cqr urban-tac shorts are constructed with a hint of military and law enforcement performance design. 6 multi-purpose cargo pockets for various tools and equipment. Gusseted underarms for freedom of movement. If you are not satisfied for any reason, money back guarantee! Tesla Gears - Materials: cotton 64% Nylon 30% Spandex 6%. Cqr bdu pants are constructed with military standard and law enforcement performance design. Military specification standard design 6 pockets with 2 button snag resistant pocket flaps for durability, ruggedness and reliability. 65% polyester 35% cotton Rip-stop fabric materials. Two adjustable ankle cuff straps for pants blousing. Cqr tactical pants are constructed with a hint of military and law enforcement performance design. Duratex fabric repels liquids, dirt, and other contaminants. 65% polyester 35% cotton Rip-stop fabric materials. Dual-layered reinforced seat bottom pattern for protection when sitting on rough terrains. CQR Men's ACU/BDU Rip Stop Trouser EDC Tactical Combat Pants UBP01 / UAP01 - High-strength high-density metal alloy snap button and zipper along with a durable mounted stopper. Dual pen pockets. Non-metal high-density plastic polymer buckle * Never worry about TSA or metal detector security★. Two side slash pockets for convience and storage of various items. Cqr brand certified guaranteed ★the best and only Tactical belt you'll ever need. Duratex repels liquids, and other contaminants : Fade, shrink, dirt, and wrinkle resistant. Topstiched finish with Flat-Fell seams throughout, strong durable construction and useful for covering raw edges. - Any gun or survival equipment can be carried, tactical trousers, casual pants, and leather and small bags can be carried as well for outdoor exercises. No hassle money back guarantee - we know you'll love our tactical belt as much as we do, let us know and our customer service team will make things right: full refund or a free replacement, If for any reason you're not 100% SATISFIED, whichever you prefer. Gusseted underarms for freedom of movement. Thickened high-quality nylon belt and strength metal buckle. Rip-resistant 1. 5" strenghtened nylon webbing ★Relatively inexpensive, virtually indestructible and lightweight★. Fade, shrink, and wrinkle resistant. Two adjustable ankle cuff straps for pants blousing / Single button Zipper closure with reinforcement flap. Its tightness and length can be adjusted freely to meet different wearing requirements. Routine wearing- the concise and elegant waistband is applicable to all kinds of overalls, and outdoor trousers as well as outdoor uses such as outward bound trainings like outdoor rock climbing, tactics and prompt drop. KingMoore Men's Tactical Belt Heavy Duty Webbing Belt Adjustable Military Style Nylon Belts with Metal Buckle - Our belt is one of the finest tactical belt options you can find. Innovative belt buckle metal parts, hole-less belt means you can adjust the length freely! Also the buckle is non-slip, no need to repeated tight, non-friction to the belt. Belt functionOur tactical belt is the perfect choice for your pouch. LA Police Gear - Moisture wicking knitted polyester fabric. Fabric content: knit-mesh chest & knit Body area C/PE/PU 56%/40%/4%. The front slip pocket is perfect for a cell phone or for an AR-15 magazine. Cqr tactical pants are constructed with a hint of military and law enforcement performance design. Duratex fabric repels liquids, dirt, and other contaminants. 65% polyester 35% cotton Rip-stop fabric materials. These pants have an athletic fit that will be roomy while not looking like parachute pants. Large cargo pockets feature LA Police Gear's top pass through for quick access and are slanted for seated access. Elastic waistband for extra comfort or is perfect for CCW. LA Police Gear Mens Core Cargo Lightweight Work Pant - Perfect design - many special force soldiers were invited to perform wearing tests when the tactical waistband was developed. We use soft tank grain braids, a kind of new braiding technology that makes nylon braids have desirable flexibility and gas permeability, dramatically enhancing the experience and comfort of wearers as well as providing the anti-tearing property of nylon braids. Buckle design- aviation class 7075 aluminum alloy is used to make the buckle. Collar flips up for UV next protection. It can endure an impact as high as 9, advanced CNC is used for processing precision, 000N without deformation or damage, ensuring that it will not break off in case of external force. Alert : one size UP for comfortable and relax fit.